Interactive systems are no longer expected to be used in confined and predefined places. By increasingly taking advantage of the physical environment, interactive systems are becoming mixed, that is, merging physical and digital worlds. 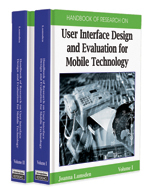 Moreover, they support user’s mobility and thus can be referred to as “mobile mixed systems.” To overcome technology-driven development processes and to take into account their physical nature and mobile dimensions, specific design approaches are required. From this perspective, we present the interweaving of an existing design model (ASUR) for mixed systems, and a 3-D environment (SIMBA) for simulating modelled mobile mixed system. The aims are to support the investigation of mobile mixed system design through the dedicated modelling approach, and to better understand the limit of the modelled solutions through their simulation. This constitutes a first step toward an iterative method of design for mobile mixed systems, based on “midfidelity” prototyping. Aeronautical Maintenance: Activity that consists in preserving planes from failure, decline, or accident. Due to the amount of documentation, space to observe, and operator’s constraints, mobile mixed systems constitute promising solutions to support the aeronautical maintenance. Component Model: Structure adopted to develop any software element of a given application or library. Model-Based Design: Early step of a development process that consists in describing the object of the design (software, interaction techniques, etc.) with a formalised notation. The notation can be textual, graphical, or a combination of both. A notation is formalised if it conforms to a metamodel. ASUR Model: Design model describing the entities involved in the user’s interaction with a mixed system. SIMBA: Platform for model-driven – simulation-based prototyping of mobile mixed systems. This platform, based on the ASUR model, provides extension facilities to add new simulated elements. Simulation-Based Prototyping (SBP): Design step that aims at producing a functional form of an interactive application that can be manipulated through a 3-D virtual environment. Cheaper and easier to produce than a high-fidelity prototype, a simulation-based prototype includes the dynamic aspects of the interactive application and the physical aspects and constraints of the interactive situation. Mixed Systems: Interactive systems involving physical and digital entities. It covers interactive systems in which digital objects enrich the user’s interaction with physical objects and interactive systems in which physical objects are manipulated to support the user’s interaction with a digital application. Other terms are also used to cover part of mixed systems: augmented reality, tangible user interfaces, and mixed reality systems. Mobile Mixed Systems: Interactive systems supporting the user’s mobility and making extensive use of the physical nature of the user’s environment. Model-Driven - Simulation-Based Prototyping (MD-SBP): Simulation-based prototyping of an interactive application tightly coupled with the description of the application using a given model.